The eyewear market in the Middle East is extremely consolidated with a very few number of players leading the market with a massive share, states a research report by Transparency Market Research. The leading players in the market are focusing on the development of new products and innovations in order to maintain the leading position throughout the forecast period. 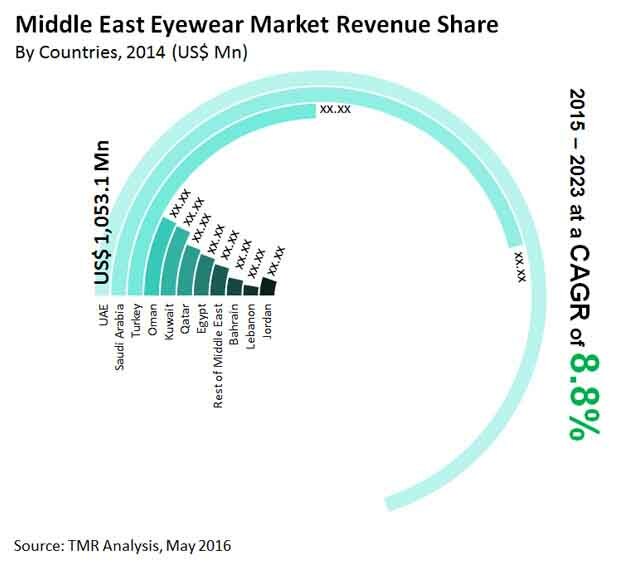 In addition, the development of the distribution channels and network and the developing e-commerce industry are some of the key factors that are expected to fuel the growth of the Middle East eyewear market in the next few years. Some of the players dominating the market are Prada, Luxottica S.p.A., Ray-Ban, and Oakley. According to the research study by Transparency Market Research, the Middle East eyewear market is expected to reach a value of US$5.86 bn by the end of 2023. The market is expected to register a healthy 8.80% CAGR between 2015 and 2023. From a geographical viewpoint, in the last few years, the UAE segment led the market and held a massive share in terms of volume as well as revenue. As per the research study, this segment is likely to remain in the dominating position throughout the forecast period, thanks to the strengthening of its economy. In addition, the easy availability of several luxury brands and a significant rise in the population of affluent consumers are expected to accelerate the growth of the overall market in the next few years. Furthermore, Saudi Arabia is projected to remain in the second-leading position in the eyewear market in the Middle East and account for nearly 24% share of the overall market by the end of 2023. On the basis of product type, the Middle East eyewear market has been classified into contact lenses, spectacles, and plano sunglasses. Among these, the segment for spectacles is likely to witness a high level of growth throughout the forecast period. The rising demand for spectacles, owing to the rising geriatric population and increasing vision-related disorders are estimated to fuel the growth of this segment in the next few years. In addition, the ease of use of spectacles and the rising inclination of consumers to spend on healthcare facilities are anticipated to accelerate the growth of this segment in the near future. The rising cases of acute myopia and other vision-related disorders are expected to encourage the growth of the eyewear market in the Middle East. The increasing disposable income of consumers and the rising preference to make use of luxury brands to enhance their sense of fashion are further predicted to supplement the growth of the overall market in the next few years. Furthermore, a tremendous rise in the population and the enhancement of the distribution channels are estimated to contribute towards the development of the market. The rising awareness among consumers regarding the complications of eye disorders if not treated is likely to boost the demand for eyewear products over the next few years. In addition, the rising number of products and increasing focus on advertising to reach a large volume of consumers are likely to supplement the market’s growth in the near future. The Middle East eyewear market, on the flip side, is estimated to face barriers, which is expected to hamper the growth of the market in the coming years. The growing inclination of consumers to perform corrective refractive surgeries is predicted to curb the growth of the eyewear market in the next few years. Nevertheless, the rising demand for sunglasses as a fashion statement is projected to bolster the Middle East eyewear market in the next few years.